Both gold and silver equities close in the green! Another withdrawal from GLD yesterday---and another monster withdrawal from SLV---the second in as many day. A tiny sales report from the U.S. Mint. Big in/out movement in gold at the COMEX-approved depositories on Wednesday---and a decent amount of silver was withdrawn. NEW YORK ( TheStreet) -- Looking at the gold price over the full 24-hour Thursday trading session, almost all the losses were in by the London open---and the low price tick came at precisely 8:30 a.m. EDT. After a few bumps it traded sideways at the London open price for most of the remainder of the day, but it did crawl a couple of bucks higher into the close of electronic trading at 5:15 p.m. EDT. The high and low ticks are barely worth the effort to look up. The CME Group reported them as $1,192.00 and $1,177.90 in the July contract. Gold finished the Thursday session at $1,184.20 spot, down $7.00 on the day. Net volume was pretty light at 99,000 contracts. Silver also got sold off in Far East trading, with the low tick of the day coming a minute or so before 9 a.m. in London. There was a rally of sorts between 9 and 9:30 a.m. EDT, but that got handled in the usual way by all the usual suspects. From 10:30 a.m. it traded pretty flat into the close. 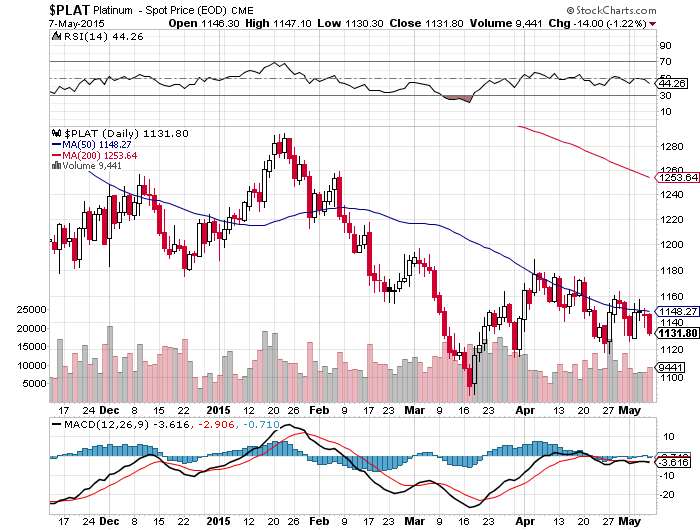 The high and low ticks in this precious metal were reported as $16.55 and $16.16 spot in the July contract. Silver closed on Thursday in New York at $16.295 spot, down another 19 cents from Wednesday's close. Net volume was pretty decent at 33,000 contracts. Platinum got sold down in a stair-step manner starting about two hours after Hong Kong trading began on their Thursday---and kept chopping lower until its low tick, which came around 11:30 a.m. in New York. After that, it didn't do much---closing at $1,130 spot, down $14 bucks on the day. Palladium was chopping sideways minding its own business until the 8:20 a.m. EDT COMEX open, with most of the selling/spoofing downside price pressure after that occurring during the final hour of COMEX trading, with the metal closing virtually on its low of the day. 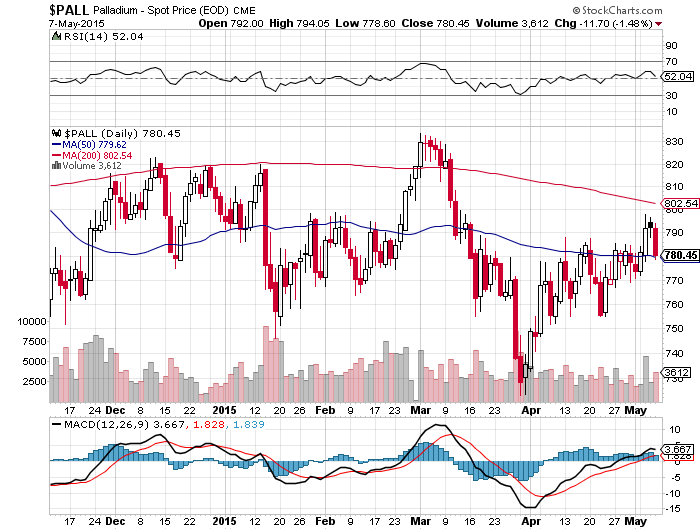 Platinum closed yesterday at $778 spot, down 12 dollars. The dollar index closed late on Wednesday afternoon in New York at 94.16. It rallied for a bit, before chopping lower. The 93.90 low tick came minutes before 11 a.m. in London---and away it went to the upside. The 94.78 high tick came about ten minutes after the London p.m. gold fix---and it gave back some of those gains by noon EDT before chopping sideways into the close. The index finished the Thursday session at 94.62---up 46 basis points from Wednesday's close. The gold stocks gapped down at the open, hitting their lows at 10:45 a.m. EDT. before beginning the slow march back towards unchanged. The rally really developed some legs starting just before 3 p.m.---and they popped into the green in the last few minutes of trading as the HUI closed up 0.34 percent. It was more or less the same chart pattern in the silver equities, except they hit their lows an hour earlier---and Nick Laird's Intraday Silver Sentiment Index closed up 0.50 percent. 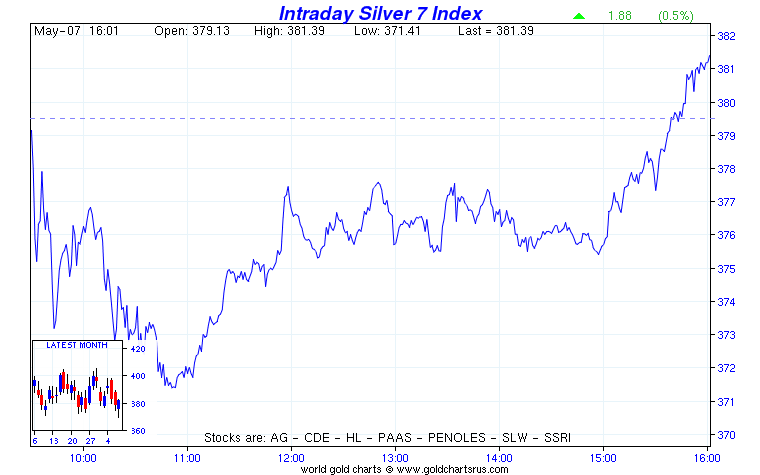 And, for what it's worth, for the second day in a row the day-ending rally in silver equities began at 3 p.m. EDT. I suspect a buy program of sorts. If you want a reason at to why precious metal equities closed up on Thursday, but down on Wednesday in the same falling price environment, you won't get any answers from me, because I simply don't know. All I can say is the counterintuitive price action in these stocks is one of their hallmarks---and as John Embry said over a decade ago, he thinks the precious metal shares are as rigged as the metal themselves. I agree totally. The CME Daily Delivery Report showed that zero gold and 70 silver contracts were posted for delivery within the COMEX-approved depositories on Monday. R.J. O'Brien issued 40---and Credit Suisse issued 30. The stoppers were JPMorgan with 24 for its clients and 23 contracts for itself. HSBC USA stopped 20 contracts. The link to yesterday's Issuers and Stoppers Report is here. 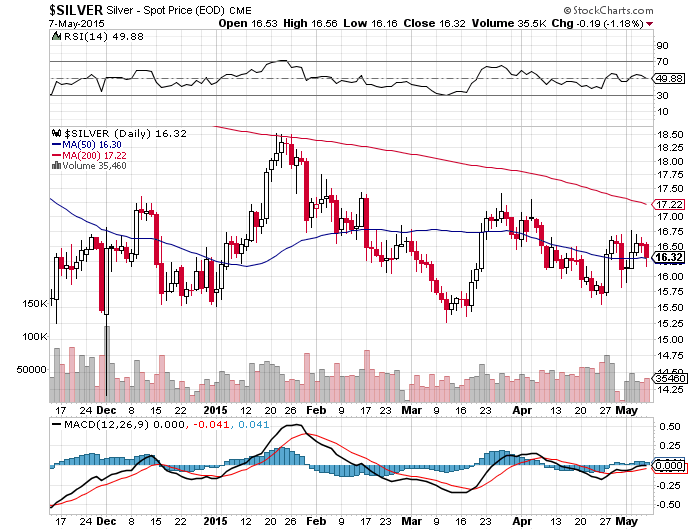 The CME Preliminary Report for the Thursday trading session showed that May gold o.i. dropped by 3 contracts down 193 left---and silver's open interest declined by 30 contracts to 746 remaining. There was a withdrawal from GLD yesterday, as an authorized participant took out 86,330 troy ounces. And must to my absolute amazement, there was another huge withdrawal from SLV. This time it was an eye-watering 2,867,874 troy ounces! That's 8.0 million troy ounces that have vanished from SLV since April 27---with 5.0 million of that coming in the last forty-eight hours. I would bet that JPMorgan owns all of it. Since yesterday was Thursday, Joshua Gibbons, the Guru of the SLV Bar List updated his website with the internal goings-on at the iShares.com Internet site at the close of trading on Wednesday. Here's his report. Analysis of the 06 May 2015 bar list, and comparison to the previous week's list: 4,150,956.0 troy ounces were removed (all from Brinks London), no bars were added or had serial number changes. The bars removed were from: Noranda (1.2M oz), Degussa (0.9M oz), Handy Harman (0.7M oz), Australian Gold Refineries (0.6M oz), and 19 others. Overallocation cannot be determined this week, as only about half of Wednesday's withdrawal has been accounted for---and the rest should be on next week's list. As of the time that the bar list was produced, it was overallocated 361.3 oz. There was a smallish sales report from the U.S. Mint. They sold 1,000 gold eagles---and 50,000 silver eagles. 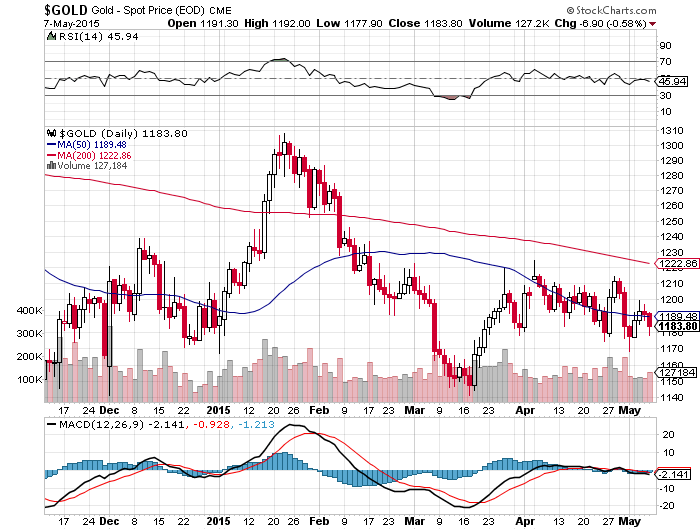 There was huge activity in gold at the COMEX-approved depositories on Wednesday. They reported receiving 116,568 troy ounces---and shipped out 123,939 troy ounces. The link to that action is here. The only activity in silver was a withdrawal of 437,259 troy ounces and, for a change, it was shipped out of JPMorgan's vault. The link to that activity is here. Over at the COMEX-approved gold kilobar depositories in Hong Kong, there were 1,730 received---and 6,350 kilobars were shipped out. It was all at the Brink's Inc. depository as usual. The link to that action in troy ounces is here. Thankfully for both us, I don't have all that many stories for you today---and I hope there are a few that strike your fancy. Let me present a specific data point that indicates that JPMorgan has been the big acquirer of Silver Eagles from the U.S. Mint over the past four years. In Saturday’s review, I commented that sales of Silver Eagles, while super strong relative to sales of Gold Eagles, had trailed off in the last few days of April. I attributed the fall off in Silver Eagle sales over the last few days of the month to be nothing more than JPMorgan refraining from buying the usual amount it has purchased over the past four years. It’s not plausible, either from normal retail buying behavior or from well-placed reports from the dealer front, that the erratic, but very strong sales of Silver Eagles to be anything but a big buyer at work. After days of no reported sales of Silver Eagles, but with reported sales of Gold Eagles, the Mint reported yesterday that for the first two days of this week, 783,500 Silver Eagles were sold, along with just 4,500 oz of Gold Eagles. I am not implying that Silver Eagles will continue to be sold at a rate 174 times greater than Gold Eagles, as that would seem impossible. What I am saying is that there is no way the broad swath of the retail buying public could possible turn off and on their buying of Silver Eagles in such a dramatic stop/start manner. This pattern of sales almost guarantees there is a big buyer at play here. All four precious metals hit new intraday lows yesterday. I discovered why silver's volume was so high, as it spent part of the trading day below its 50-day moving average---and it closed just at it. So the technical funds in the Managed Money category were puking longs and buying short---and since JPMorgan et al engineered that particular decline, they were standing at the ready, happily taking the other side of those trades. It's the same old, same old. As usual, here are the 6-month charts for all four precious metals, so you can see yesterday's low ticks for yourself. And as I write this paragraph, the London open is fifteen minutes away. There was virtually no price activity in any of the four precious metal up until 2 p.m. Hong Kong time, which is an hour before the 8:00 a.m. BST open in London. At that very moment, all four of them began to edge higher---and all are up a bit from their respective closes in New York on Thursday. Not surprisingly, net gold volume is extremely light, about 8,800 contracts at the moment---and silver's net volume is barely fogging the proverbial mirror at just under 2,200 contracts. At the moment, all is calm as the precious metal world awaits its fate at the 1-week-delayed jobs report due out at 8:30 a.m. EDT this morning. The dollar index has been rallying in fits and starts all through Far East trading on their Friday---and is currently up 26 basis points. As I mentioned in today's last story, we get the latest Commitment of Traders Report, plus the monthly Bank Participation Report later this afternoon EDT. That will give Ted the opportunity to recalibrate JPMorgan's short-side silver corner in the COMEX futures market---and we'll both be interested in the changes in the commercial net short positions in both metals, along with the equally important changes in the Managed Money category. Of course not to be overlooked are what the world's bullion banks have been up to in all four precious metals during the last month---as of the close of COMEX trading on Tuesday. As you already know, dear reader, they're usually up to quite a bit. And as I fire today's column out the door at 5:30 a.m. EDT, I note that the smallish rallies in three of the four precious metals ended about forty-five minutes after London opened---and palladium was dealt with about fifteen minutes after that. At the moment, both gold and silver are back to about unchanged, but platinum and palladium are still up decent amounts. Gold's net volume has risen to just over 18,000 contracts, up 10,000 from when I reported on this about three hours ago---and silver's volume is a hair under 5,000 contracts. These volume amounts are still very much on the lighter side---and although I really don't want to read too much into the current price patterns based on that volume, it certain does appear that a willing seller is out there somewhere. The dollar index has now fallen back to about unchanged---and is currently up 2 whole basis points. Well, dear reader, you can place your bets on what JPMorgan et al---along with the HFT buddies and their algorithms---are going to do seconds before or at 8:30 a.m. My bet is down, but it won't stay there for long if that's the way it unfolds. We'll soon see. That's all I have for you today which, once again, is more than enough. Enjoy your weekend, or what's left of it if you live west of the International Date Line---and I'll see you here tomorrow. This is an abbreviated version of Silver's Top 10s: Countries, Companies and Mines—Lawrence Williams, from Ed Steer's Gold & Silver Daily.Sign-up to have to the complete market review delivered to your email inbox each morning for free.